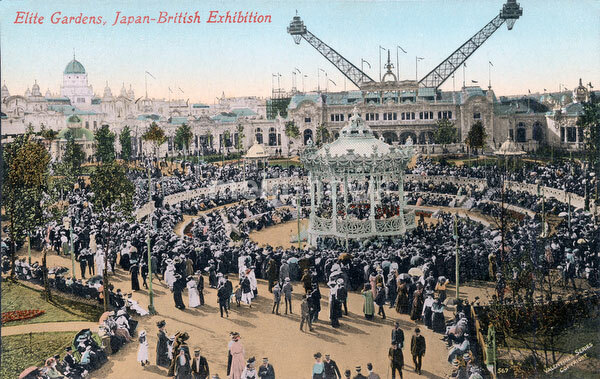 An orchestra performs at the Elite Gardens during the Japan-British Exhibition at White City, London in Great Britain. The ride in the back is the Flip Flap. The exhibition was held from May 14 to October 29, 1910 (Meiji 43). The exhibition was meant to cement ties between the UK and Japan, improve Japan’s image as a developed country and improve trade between the two countries. It was Japan’s largest international exposition to date. It attracted 2,271 Japanese exhibitors and over 8 million visitors. With a population of just over 30 million, this means that more than 1 in 4 people in the UK visited the exhibition.